Turn Right onto Maple Lane from Hay Flat road. Can be done easily in dry weather but gets slippery after rain. Steep Climb and Descents for a bit of fun. Low range when wet. Maple Lane is off Hay Flat road. If you are heading into Normanville on main south rd you take a left at a art gallery called "seagull droppings", there is also a sign saying "ingallala falls". 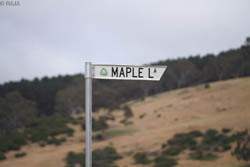 Maple lane would be approx 5km down this road. and it is on the right hand side, it is the next right after "tonto road". the "maple Lane" road sign has only just been added approx 4 months ago, so not sure if it will show up on any maps..when i first found the track a few years back it was not signposted at all. if you follow the track through it ends up on range road, near tunkalilla road( tunk rd leads to deep creek) Track is just a rutted/rocky road that has a few houses and properties on it, but it is a public road.